*Dacryocystitis Dacryocystitis is treated with oral augmentin and topical erythromycin. Neonatal conjunctivitis within 2-5 days of birth consider gonorrhea. Within 5-14 days of birth consider Chlamydia. Both infections require oral and topical antibiotics. *HSV Keratitis This is a potentially vision-loss infection. Consult with Ophtho while the patient is in the ED. 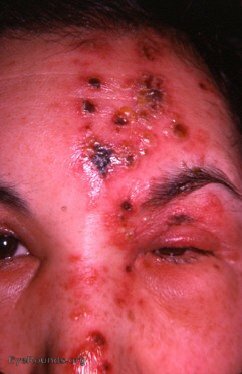 *Herpes Zoster Keratitis. Look for Hutchinson’s sign, which is a zoster lesion on the tip of the nose. Huthinson’s sign is a marker of corneal involvement by the herpes zoster virus. When evaluating kids with eyelid swelling it is usually not orbital cellulitis. Bug bites, pre-septal cellulitis, and allergic reactions are much more common. If the child has normal eye movement, normal pupillary function, may have a sensation of pruritus, appears non-toxic with no fever, treat it as pre-septal cellulitis. Give the patient oral antibiotics and discharge home. If you have concern for orbital cellulitis: the child has fever, sicker looking kid, the child has eye pain, no pruritus, limited eye movement, start IV antibiotics and don’t get a CT on day 1. Obtain a CT only if the patient is not improving on IV antibiotics. Early CT will rarely will change management. Subconjunctival hemorrhages are generally benign. Ask the patient about coughing, sneezing, anticoagulant use. Tekwani comment: If you have a 360 degree subconjunctival hemorrhage you may want to evaluate for globe rupture. Consider a CT of the orbit if there is a history of trauma. *Retrobulbar Hematoma with vision loss and non-reactive pupil should be treated with lateral canthotomy. *Hyphema Keep head elevated. Avoid NSAID's. Consult Ophtho. *Central Retinal Artery Occlusion. Treat with eye massage, anterior chamber paracentesis by Ophthalmology, having patient breathe in a paper bag, and possibly hyperbaric therapy. Typical presentation is polyuria, polydipsia, and polyphagia. Patients commonly will have nausea, vomiting, abdominal pain and body aches. DKA is a problem of too little insulin. Hyperglycemia is the symptom, not the problem. HHS and DKA are on a spectrum. HHS patients have a little bit of insulin to limit ketosis but not hyperglycemia. HHS is less common and has higher mortality. Cerebral edema occurs in <1% of DKA cases. Cerebral edema is more common in kids and patients who present with more severe acidosis. Avoid over-aggressive fluids. Avoid insulin bolus and bicarb drips. No one is sure of the cause. Attending consensus was to be cautious with IV fluids in kids. If you think the patient has cerebral edema, treat with hypertonic saline5 ml/kg over 10 minutes. When giving fluids follow the DKA protocol. You need to be measured with your fluid resuscitation. Adults can handle an initial first liter of saline then start your hourly rate. Kids at most should receive an initial 10ml/kg bolus. If the pediatric DKA patient is not in shock don’t give a bolus. Just start an hourly rate per protocol. Don’t bolus insulin. Start a drip at 0.1u/kg. Follow the protocol from there. Bolus insulin increases the risk of cerebral edema. VBG’s are adequate for DKA testing. pH, bicarb and lactate are very consistent between VBG and ABG. ETOH intoxication blocks hepatic metabolism of glucagon and can result in hypoglycemia in the diabetic. For the same reason, glucagon won’t work to correct hypoglycemia in the intoxicated patient. 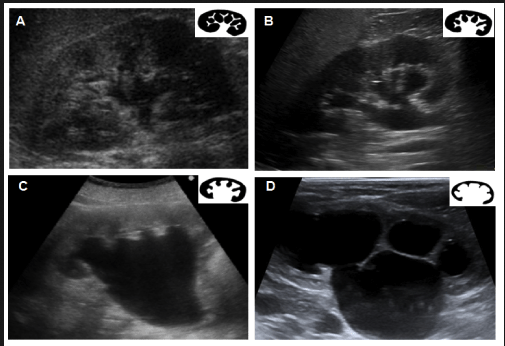 The upper limit of normal for gallbladder size is 4cm in the AP diameter and 10 cm in the longitudinal diameter. When scanning the abdominal aorta start in the epigastrium. You will need to hold steady pressure with the probe to displace bowel. Aim the probe slightly inferiorly to image in the plane of the aorta. Keep the indicator on the probe pointed to the patient’s right side. You have to scan the proximal, middle and distal aorta. Most aneurysms are infra-renal. Mike suggested also scanning the iliac arteries in older patients (over age 80) to look for iliac artery aneuryms.